Barack Obama has installed solar panels on the white house. His officials confirmed that a set of solar panels on the roof of the White House are now producing energy. In tandem with this Obama will use his executive authority to announce $2bn funding for energy-saving measures (such as solar panels) at federal government buildings, as well as new financing and training programmes for installing solar panels. The announcements are following the release of an authoritative report on the growing threat posed by heat waves, severe downpours and sea-level rise. the use of Solar panels and other low carbon energy technologies are key to eliminating these threats. White House officials told reporters the new initiatives were intended to further boost to the solar panels industry which has seen impressive expansion over the preceding two years. “We are going to be doing everything we can, with the tools that we have to move forward,” stated Dan Utech, special assistant to the president on energy and climate change. The White House began installing a set of solar panels on the roof last summer with the fit now complete. A video has been released of the installation of the solar panels which was said to be modelled on a typical sized American household. “The size of the array we established here is the typical size for the average American house, ” said James Doherty, the White House usher. Security concerns had prevented the whole roof being covered, he said. The solar panels were part of a larger energy retrofit at the White House, showing how it is possible to use solar panels and renewable energy even in historic buildings, officials claimed. Solar panels were already installed at the White House under Jimmy Carter but Ronald Reagan took them down in 1986. Obama brought in the latest solar technology as a sign of his commitment to solar and other renewable energy technologies. Payback on the installation of the solar panels is estimated at 8 years. Solar power form solar panels is the fastest-growing source of renewable energy in America. It currently provides 1% of overall electricity generation, according to the Energy Information Administration. The president travelled to California on Friday to visit a Walmart store in Mountain View, where the company will commit to doubling its use of solar power form solar panels. Walmart already produces and uses more solar power than any other retailer. Solar energy amounts to about 4% of its overall energy use provided by solar panels, according to the Environmental Protection Agency. The measures to be introduced add to a number of programmes that have made it easier and affordable for companies and householders to install solar panels. Tax credits have helped reduce the costs and the price of solar panels has fallen by 50% from 2010. 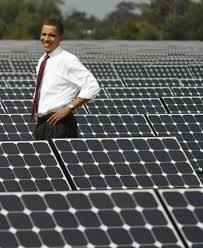 Obama will announce measures intended to make solar panels affordable with new programmes to train solar installers at community colleges.